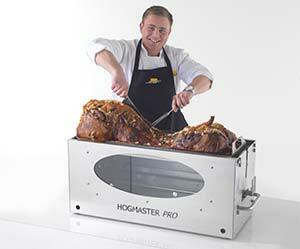 The Hog Master have been in the hog roast machine selling business for many years now and are thoroughly pleased to be one of the best selling hog roast machines sellers out there and it is all thanks to an idea my colleague had when he was working for a mobile catering business. He started out working as a mobile catering worker, gaining a vast knowledge of culinary skills and experience. Gaining this he decided to use those skills and he started up a small hog roast catering business that was home run plus keeping with his regular job. Locally starting gaining a feel and testing the water, he concentrated on the fundamentals, great traditional food cooked fresh on site in front of the waiting customer. The customers loved it; the smell, the taste and not forgetting the crackling it was a whole new experience for some customers and they came back again and again not before long it became a full time job. Purchasing a hog roast machine and spit roasted machines was frustrating due to the fact there was always a design flaw or limitations, making adjustments to the machine became tiresome and time wasted. So he thought of a project to create his own hog roast machine; The Hog Master, to get the perfect results and ease of roasting plus comfort and no limitations. 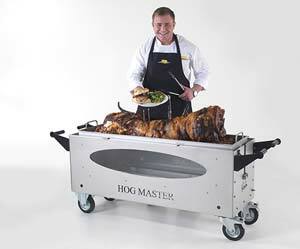 After a long year of designing, development and testing the Hog Master was finally completed, a project which was initially intended for him has turned into a world wide project due to the face that other people has the same problem as he did, in the design stage he twigged and thought there was a gap in the market for a reliable, affordable and perfect hog roast machine. There is now a dedicated factory creating and storing these Hog Masters, creating enough Hog Master for all year round. They are now being sold all over the world, selling them to Holland, Austria, France, Saudi Arabia, Spain Poland, Germany and a whole range of other countries. The factory is also creating a number of accessories. This is an outstanding achievement from a mobile catering business to the owner of a world known company is truly amazing. I am glad to be a part of this esteemed company which has worked its way from the ground upwards. The company is destined to go on to bigger and greater things. Machine Hire for a Party! !